DirecTV’s Customer Support – Oy! Last weekend I upgraded my DirecTV DVRs to the company’s brand new Genie system. One of the cool features they highlight on their website: “Catch up on past episodes, as far back as 5 weeks.” This was particularly important to me since when you upgrade, you lose all the shows you had previously recorded on your DVRs which they take away with them after the Genie is installed. No problem, I thought. Most of that stuff was recorded in the last 5 weeks so Genie can just re-record it, right? “Thank you for writing to ask on how to catch up on past episodes when using the Genie receiver. We do not have any receivers that have the ability to start a show over if it was not recorded and it has already aired or begun. This is because the tuners in the DVR store a cache or buffer of each program (up to 90 minutes), so none of the programming is missed. However, if the receiver was just change to another channel then nothing has been stored, it cannot be recorded or restarted. 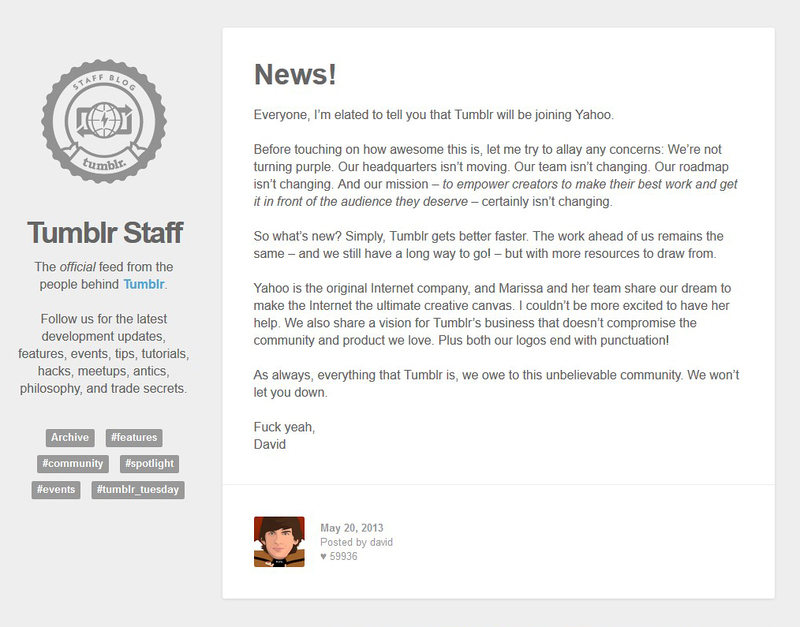 Everyone has by now heard that Yahoo has agreed to acquire Tumblr for $1.1B. Smart move by Yahoo? Getting Tumblr’s 134 million eyeballs is a good thing. Paying that much for a company that did just $13M in sales in Q1 and burned through $25M in cash last year, is… a big bet.